Here is Anuj Tiwari, who, unlike a lot of youth who are passionate about technology but wait till they get a job to work on technology, he believes the right time is when you feel it is. There is a short story behind Anuj, to become such an action-oriented individual, who knows about the right decisions he need to take according to the situations. Brought up in a typical Hindu family in Maharashtra, he was instilled the knowledge of the tradition and Indian culture. He had a lot of love for speaking, from his school days and although he had the fear of stage, he would still go to stages and speak because of the passion he had toward speaking. He recollects, “Fights, Broken bones, Blood, Punishment were a part of my school life, but, due to my speaking and presentation skills, I got an opportunity to represent my school in district level science exhibition in 2009.Surprisingly, I won that competition and became the first kid to go ‘State Level Science Exhibition’ from my district”. His participation in multiple activities like speech, essay, elocutions won a lot of prizes, recognition and love from people around him. He completed his schooling and passed out with a score of 88 percent and he recalls, “it was pre-decided for me to take up science as my main subject and with a good score, I, obviously got into a reputed college”. Anuj got several opportunities to exhibit his talent of speech and his interest in physics and math developed. He wrote technical papers, along with the guidance of his mentor, who took the papers to his mentor to publish and get patent. His passion towards the subject of biology too increased, he wanted to take up MBBS, become a doctor and serve people, but, he was unable to crack the examinations, which he had to clear to take up MBBS and hence, was forced to become an engineering student. He got his admissions from MGM college of engineering and technology, but, since his passion was to become a doctor, he was depressed. None of his friends showed up. The papers he wanted to file a patent for, there were others who took away the name and with no records or documentation, he had to let go of it and was devastated. “With all dreams and hope scattered, after facing cruelty of life and people, I disconnected myself from social media, friends and almost everyone, except a very few” he says. Then, came an opportunity for Anuj to get back on track. A gentleman,Mr. 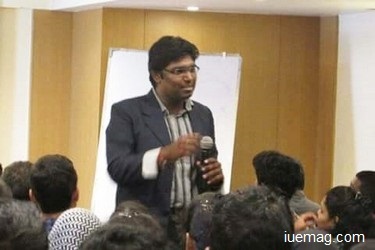 Bharath GC(now, his mentor) entered his class, inspired the students about life and its purpose, because of which Anuj happened to connect to him further to be a part of the inspirational talk, where he was introduced about the platform of i3. He happens to share about his journey at i3, “After I joined i3, once again, I started dreaming, becoming active, focused and I developed my entrepreneurial spirit. I also executed various projects in i3 which helped me get back to momentum. I worked on projects like sports equipment procurement campaign, which was a great opportunity to help the future generation of our country, iU NewsPaper Bag campaign where I learned to make innovative idea for replacing the materials which causes harm to our environment, 36 meals - a meal donation project which is very close to my heart. Executing such projects only made me a better person than before”. His impacts resulted in making him one of the best performers of i3 and was hence, tagged as a True IUITE of i3 season 1, Mumbai, for his brilliant performance! Anuj got back his days, where he performed and today, in his final year of engineering, he has developed mobile applications like Focus Maniac, Router Setup and SpeedTest, which is loved by the users. While Anuj comes up with more mobile applications, he also continues to live his dream as a speaker inspiring a lot of youth!